Pain is an unpleasant sensory and emotional experience associated with actual or potential tissue damage (Merskey & Bogduk). Pain is “an unpleasant sensory and emotional experience associatedwith actual or potential damage or described in terms of such damage; ef pain is always subjective” (International Association for the Study of Pain, 1979). Pain is categorized according to its duration, location, and etiology. Three basic categories of pain are generally recognized: acute pain, chronic (nonmalignant) pain, and cancer-related pain. One view explain that pain is a sense similar to vision or hearing, a component of the sensory that warns us of impending damage, gives accurate information to the brain about injuries, and helps us to heal. The inclusion of pain in The Senses: a Comprehensive Reference, alongside vision, hearing, or olfaction shows that this view is persuasive. But there has always been an alternative interpretation of pain. Pain is seen as a trigger of emotional states, a behavioral drive, and a highly effective learning tool. Aristotle, who was the originator of this view, made it very clear: there are only five senses – vision, hearing, touch, taste, and smell. Pain and pleasure are not senses but passions of the soul. For purposes of definition, acute pain can be described as lasting from seconds to 6 months. However, the 6-month time frame has been criticized (Brook) as inaccurate since many acute injuries heal within a few weeks and most heal by 6 weeks. Usually of recent onset and commonly associated with a specific injury, acute pain indicates that damage or injury has occurred. Pain is significant in that it draws attention to its existence and teaches the person to avoid similar potentially painful situations. If no lasting damage occurs and no systemic disease exists, acute pain usually decreases along with healing. In a situation where healing is expected in 3 weeks and the patient continues to suffer pain, it should be considered chronic and treated with interventions used for chronic pain. Waiting for the full 6-month time frame in this example could cause needless suffering. Unrelieved acute pain can affect the pulmonary, cardiovascular, gastrointestinal, endocrine, and immune systems. The stress response (neuroendocrine response to stress) that occurs with trauma also occurs with other causes of severe pain. The stress response generally consists of increased metabolic rate and cardiac output, impaired insulin response, increased production of cortisol, and increased retention of fluids. Chronic pain is constant or intermittent pain that persists beyond the expected healing time and that can seldom be attributed to a specific cause or injury. Chronic pain may be defined as pain that lasts for 6 months or longer, although 6 months is an arbitrary period for differentiating between acute and chronic pain. An episode of pain may assume the characteristics of chronic pain before 6 months have elapsed, or some types of pain may remain primarily acute in nature for longer than 6 months. Suppression of the immune function associated with chronic pain may promote tumor growth. Also, chronic pain often results in depression and disability. Although health care providers express concern about the large quantities of opioid medications required to relieve chronic pain in some patients, it is safe to use large doses of these medications to control progressive chronic pain. Pain associated with cancer may be acute or chronic. Pain resulting from cancer is so ubiquitous that after fear of dying, it is the second most common fear of newly diagnosed cancer patients (Lema). Pain in the patient suffering from cancer can be directly associated with the cancer (eg, bony infiltration with tumor cells or nerve compression), a result of cancer treatment (eg, surgery or radiation), or not associated with the cancer (eg, trauma). Most pain associated with cancer, however, is a direct result of tumor involvement. A number of algogenic (pain-causing) substances that affect the sensitivity of nociceptors are released into the extracellular tissue as a result of tissue damage. 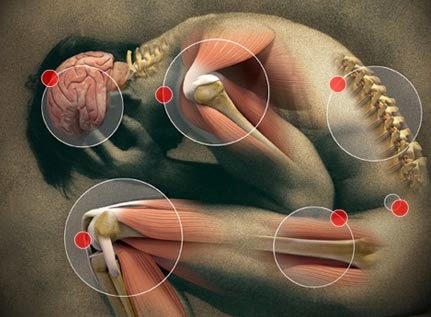 Histamine, bradykinin, acetylcholine, serotonin, and substance P are chemicals that increase the transmission of pain. The transmission of pain is also referred to as nociception. Prostaglandins are chemical substances thought to increase the sensitivity of pain receptors by enhancing the painprovoking effect of bradykinin. These chemical mediators also cause vasodilation and increased vascular permeability, resulting in redness, warmth, and swelling of the injured area. Once nociception is initiated, the nociceptive action potentials are transmitted by the peripheral nervous system (Porth, 2002). The first-order neurons travel from the periphery (skin, cornea, visceral organs) to the spinal cord via the dorsal horn. There are two main types of fibers involved in the transmission of nociception. Smaller, myelinated Ad (A delta) fibers transmit nociception rapidly, which produces the initial “fast pain.” Type C fibers are larger, unmyelinated fibers that transmit what is called second pain. This type of pain has dull, aching, or burning qualities that last longer than the initial fast pain. The type and concentration of nerve fibers to transmit pain vary by tissue type. The same noxious stimulus produces hyperalgesia, and the person reports greater pain than was felt at the first stimulus. For this reason, it is important to treat patients with analgesic agents when they first feel the pain. Patients require less medication and experience more effective pain relief if analgesia is administered before the patient becomes sensitized to the pain. Chemicals that reduce or inhibit the transmission or perception of pain include endorphins and enkephalins. These morphinelike neurotransmitters are endogenous (produced by the body). Endorphins and enkephalins are found in heavy concentrations in the central nervous system, particularly the spinal and medullary dorsal horn, the periaqueductal gray matter, hypothalamus, and amygdala. After tissue injury occurs, nociception (the neurologic transmission of pain impulses) to the spinal cord via the Ad and C fibers continues. The fibers enter the dorsal horn, which is divided into laminae based on cell type. The laminae II cell type is commonly referred to as the substantia gelatinosa. In the substantia gelatinosa are projections that relay nociception to other parts of the spinal cord. The interconnections between the descending neuronal system and the ascending sensory tract are called inhibitory interneuronal fibers. These fibers contain enkephalin and are primarily activated through the activity of non-nociceptor peripheral fibers (fibers that normally do not transmit painful or noxious stimuli) in the same receptor field as the pain receptor, and descending fibers, grouped together in a system called descending control. The enkephalins and endorphins are thought to inhibit pain impulses by stimulating the inhibitory interneuronal fibers, which in turn reduce the transmission of noxious impulses via the ascending system (Puig & Montes). The noxious impulses are influenced by a “gating mechanism.” Melzack and Wall proposed that stimulation of the large-diameter fibers inhibits the transmission of pain, thus “closing the gate.” Conversely, when smaller fibers are stimulated, the gate is opened. The gating mechanism is influenced by nerve impulses that descend from the brain. Pain experience is influenced by a number of factors, including; past experiences with pain, anxiety, culture, age, gender, and expectations about pain relief. These factors may increase or decrease the person’s perception of pain, increase or decrease tolerance for pain, and affect the responses to pain. The factors to consider in a complete pain assessment are the intensity, timing, location, quality, personal meaning, aggravating and alleviating factors, and pain behaviors. The pain assessment begins by observing the patient carefully, noting the patient’s overall posture and presence or absence of overt pain behaviors and asking the person to describe, in his or her own words, the specifics of the pain. The words used to describe the pain may point toward the etiology. 5. Read minister pain assessment scale.